The Mount Hood National Forest, originally established as the Bull Run Forest Reserve on June 17th, 1892, was combined with a portion of the Cascade National Park to become the Oregon National Park in 1908, and received its current name in 1924. The forest encompasses just over one million acres, located over portions of six Oregon counties, and is filled with old growth Douglas fir trees. More than four million annual visitors enjoy many different outdoor activities, including hiking, rafting, fishing, hunting, horseback riding, and mushroom collecting. 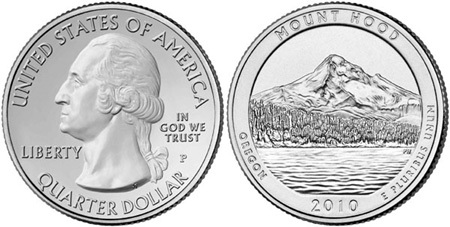 As part of the America the Beautiful Quarters Program, Mount Hood National Forest will be depicted on the reverse of a circulating quarter dollar. The coin depicts the mountain, rising from the forest, with Lost Lake in the foreground. Also included in the design are the incused inscriptions “Mount Hood”, “Oregon”, and “E Pluribus Unum”, as well as the date of issue. The coin will represent the fifth and final issue of the program for 2010. The circulation release date for the Mount Hood National Forest Quarter will be November 15, 2010. 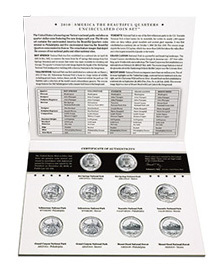 The quarters will also be available in the following numismatic products from the United States Mint. Visit www.usmint.gov for current prices and to order, or call 800-USA-MINT (872-6468). A launch ceremony for Mount Hood Quarter has been planned for November 17, 2010 at 10:30 AM PT. The ceremony will take place at the World Forestry Center at 4033 SW Canyon Road in Portland, Oregon. The evening before, a public forum will be held where collectors can have an opportunity to meet with US Mint Deputy Director Andrew Brunhart.